Munich designer agency Designliga have created Cabaret Voltaire, a gallery project in Berlin that combines an event space with a parallel digital space. The sparsely-furnished space is described as "a homage to historical Dadaism", hosts a series of cultural activities which can be experienced remotely as abstract patterns by web visitors. Activity in the space is linked to the project's website (cabaretvoltaire.de), where viewers experience patterns created from data recorded by sensors on the ceiling of the venue measure changes in activity. Meanwhile, data from these visitors controls a lighting display at the venue. The simple pine furniture fits together to form a box small enough to be transported in a minivan, allowing the project to travel in future. A location with a Dadaist background was recently added to the popular urban scene in Berlin’s district of Friedrichshain: the gallery project “Cabaret Voltaire,” a platform for cultural events, allows its guests to interact in real time with the visitors on the website. Real and virtual space have a mutual impact on one another, without the participants becoming consciously aware of this. Munich/Berlin: Everything is in a state of flux – this might be the motto of Berlin’s “Cabaret Voltaire.” Since late February, artists, musicians, writers, but also DJs and designers have been meeting regularly in the minimalist environment of a former store. Since then it has been a quite lively location: as diversified as the events in the Wilhelminian-style building are, as motley is the crowd that frequents the place. The idea of the project: As in 1916, when Dadaism came into being at the legendary Cabaret Voltaire in Zurich, not only the program changes on a daily basis but so do the audience and the atmosphere of the place. Users of the homonymous website (www.cabaretvoltaire.de) can experience this constant change in real time and in the best Dadaist tradition at home: The screen does not show live broadcasts from the place where it’s all happening. Rather, it offers a “vibrating reflection” of it whose graphics signals and changing typefaces are only codes that represent reality. Conversely, the online visitors have an impact on those who are actually present at the Berlin location at that specific time: the coded user information produces wandering light phenomena on a glass wall of 1 x 2.5 meters at the Cabaret Voltaire via feedback. As a result, all visitors – whether sitting at their home computer or “really” there – are linked with one another without being consciously aware of it. A modern MIDI interface digitalizes its analog signals and transmits them via a USB interface to a computer, where a program interprets the incoming data. Depending on the dynamics inherent in the registered data, a constantly changing design pattern is generated on the monitors of the website visitors. At the Friedrichshain gallery, however, a thermal plotter moves along a glass surface coated with thermo-sensitive screen printing ink, generating bright gradations. During the entire process not one second is recorded and stored, as this would run completely counter to the authentic intent of the operators and inspirators of the modern Dada gallery. The background: The concept of the “Cabaret Voltaire” project in Berlin was “made in Munich”: it was created by the graphic design company designliga and was technically developed and realized in close cooperation with the firm Form&Code. 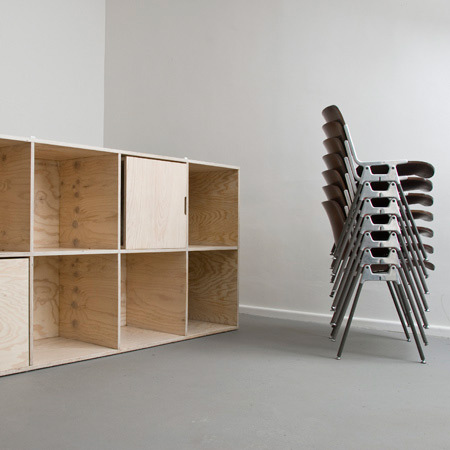 With its multifunctional, modular furniture made of maritime pine wood, Cabaret Voltaire’s entire interior is furthermore extremely mobile: stacked away in a single box it would fit into a minivan. So we may look forward to guest performances of the intelligent Dada homage in other cities. After all, everything is in a state of flux!